If you're on the hunt for the best Android smartphone around, you've come to the right place. We've put all the major Google-powered handsets through their paces to give you our best Android phones round-down. 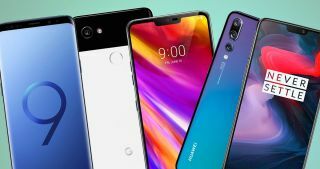 Update: The Huawei P30 Pro and Huawei P30 have all been through our in-depth review process and they've managed to nab a place in our best Android phone list. Read on to find out where they place. The big names are all here. The many variations in screen size, processor power, software features and design makes finding the best Android phone for you extremely tough. And it's set to get tougher, with the Nokia 9 PureView set for a full review soon, plus with the launch of the Sony Xperia 1, LG G8, LG G8S and V50 ThinQ our best Android phones list could witness more changes over the coming weeks. So here they are - the best Android phones money can buy today. The Samsung Galaxy S10 Plus is the best Android phone you can buy right now, packing the best of what Samsung has to offer. The Super AMOLED 6.4-inch display has been measured as the very best around, with super colours, plus there's a fingerprint scanner embedded in the display. Battery life is an improvement over the S9 Plus, thanks to the larger 4,100mAh battery inside and you also get Samsung's new Wireless PowerShare, allowing you to wirelessly charge other devices on the rear of the handset. The Huawei P30 Pro could be the best Android phone we've used when it comes to photography. Its 5x and 10x zoom capabilities are staggeringly good. It also performs fantastically well in low light. For those who really want to get up close to their subject, the P30 Pro also offers a 50x digital zoom, and although quality is reduced it's still impressive. You also get plenty of power under the hood, an in-display fingerprint scanner, premium design and wireless charging with the ability to wireless charge other devices from the back of the P30 Pro. It's a top, top Android phone and only narrowly misses out on top spot due to the Galaxy S10 Plus' overall slicker and more rounded smartphone experience. It's close at the top, with Huawei snapping at Samsung's heels it's never been tougher for the South Korean firm, but the Galaxy S10 still manages to muscle its way into number three spot. The bigger S10 Plus is by far Samsung's best phone, but the standard S10 backs almost all the same top-end features into a more compact form factor and slightly lower price tag (but still steep). The Samsung Galaxy S10 gets proper under-the-hood upgrades. You’ll like all of these powerful features, while your friends will like the new Wireless PowerShare perk – it helps them out more than you. The Huawei Mate 20 Pro offers up a heady mix of design, power and performance with a party piece in the form of an in-display fingerprint scanner thrown in too. The South Korean features again with Galaxy Note 9 in at five in our best Android phones lists. The Galaxy Note 9 boasts a huge screen and a huge amount of power under the hood, plus there's the iconic S Pen stylus which slides into the body of the phone for safe keeping. It means the Note 9 offers a huge array of productivity functions few phones can compete with, but the overall package isn't quite as finessed as the Galaxy S10 Plus - not to mention its high price tag. For power users who want a phone that will doing pretty much anything they ask of it, the Galaxy Note 9 is a top choice. What's this? Another Huawei phone in the top ten? Your eyes do not deceive you, the Huawei P30 really is sixth in our best Android phone rundown. It has a smaller screen than the P30 Pro, and makes do with just the three rear cameras (rather than four) and a maximum zoom of 30x, but it's still a great Android phone. There's heaps of power, a handy headphone jack (something the Pro can't boast) and a more manageable form factor for one-handed use. And of course, it's a little cheaper too. Like the look of the new S10 and S10 Plus, but not a fan of their lofty price tags? Well fear not, as Samsung has catered for you with the Galaxy S10e. The Galaxy S10e has many of the flagship features of its pricier siblings, while offering a more palm-friendly size and a few compromises to help keep the cost down. It’s hard not to recommend the S10e to anyone who prefers a smaller phone. Size queens, look elsewhere - this smartphone is for folks who want to text and browse apps one-handed without compromising performance. The Honor View 20 is the best phone to come out of the Chinese brand, with a striking rear design (which may divide opinion), plenty of power under the hood, an impressive 48MP camera and a 'punch-hole' display which ushers in the post-notch revolution. There's a huge 6.4-inch display on the View 20, giving you plenty of space to play with. It's the location of the front-facing, 25MP camera within the screen which is the real talking point though, as rather than appearing in a bezel or a notch which juts into the screen, it's surround by screen. The Honor View 20 has a big 4,000mAh and the result is a battery which will comfortably last through an entire day and into the next on a single charge. It's also the world's first smartphone to boast a 48MP rear camera, as the firm has used Sony's new sensor to provide a camera which really packs a punch. An ultra-high-resolution camera and punch hole screen are the highlights on the Honor View 20, and they set a standard this year’s more expensive phones will need to match.